There were long lines to get into the Baldivis Halloween Haunted House. Photo by Jon Hewson. THE Halloween Haunted House Community Event in Baldivis is in doubt next year after a complaint from a resident prompted a City of Rockingham inspection. More than 1000 people attended the haunted house on Wednesday night, to enjoy a spooky spectacle, lollybags and ice creams. The event raised about $2000 towards a food van for Rockingham’s CREW – Christians Ready Equipped and Willing. 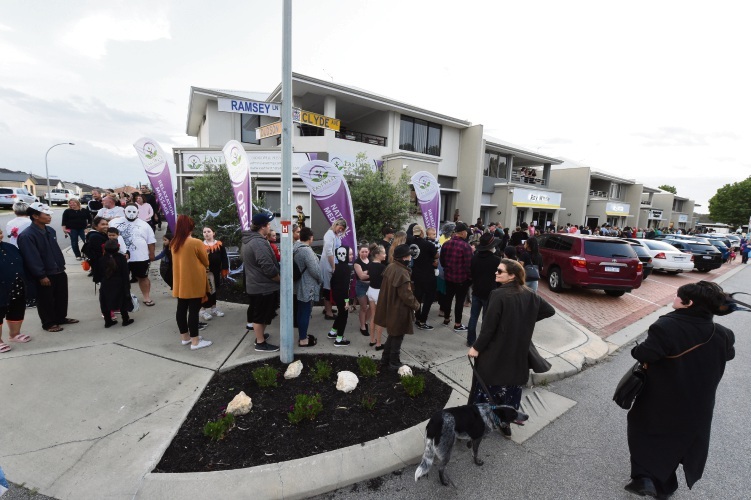 Willow Tree Realty Principal Janette Abbott said the community spirit was amazing and the feedback from the public was positive. Letters were also sent to residents in the vicinity notifying them of the fundraising event. However, Mrs Abbott said they were accused of creating a public nuisance. She said there were issues with access to a laneway. “We were told we would need council approval, which comes with application fees,” she said. “We were told we’ll need six toilets and fire extinguishers. “It only goes for four hours. Mrs Abbott said everyone who attended had a great time. “There were lots of screams and laughs,” she said. The City of Rockingham’s Customer Service Team received a complaint via telephone on October 31 regarding a street in Baldivis being blocked off and a resident could not access their property. Mayor Barry Sammels said council had a policy and guidelines regarding the organisation of events, which could be accessed on the City’s website. “We encourage residents who are planning to host an event to contact the City so our officers can work with them to ensure that all legislative requirements are met,” he said.